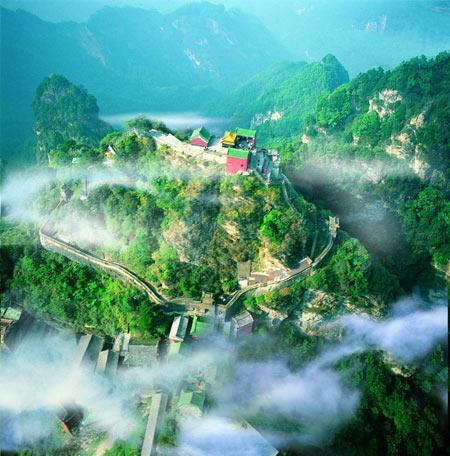 Wudang Mountain is the holy land of Daoism. It is also the place where its founder, the great Daoist priest Zhang San Feng, established his skill. Zhang San Feng was inspired by watching a snake fight a bird. He thought about martial arts, learned advantages from others, and combined Daoist fighting techniques in order to create the Tai Ji Quan 13 style. The Tai Ji Quan 13 style, also known as Nei Jia Quan or Wudang Nei Jia Quan, has formed the basis of Wudang Internal Martial Arts . Wudang Internal Kung Fu is based upon the principles of Infinity (Yi Wu Ji), Supreme Ultimate (Tai Ji), and Two Extremes (Liang Yi Wei Yi). By combining these principles, various styles have developed and flourished over the years. Wudang Internal Kung Fu has the characteristics of overcoming toughness with flexability, hardness with softness & movement with stillness. Wudang Kung Fu not only provides the function of body-strengthening & self-defense but can also preserve ones inner energy. Internal Sanfeng Boxing Being promoted very famous by Huang Zhonxi, who lived in early Qing Dynasty, such boxing passed on to Wang Zhengna who taught Huang Baijia. In the book Orgin of Internal Boxing there carry the following message as "Shaolin boxing is famous for the valor it demonstrates but because ot prefers to take action first and the opportunity is offered in the same time for opponent to take advantage. Internal boxing, on the contrary, can arrest the motion with stillness, and can get in the opponent in an instant. Differing much from Shaolin, internal boxing originated from Zhang Sanfeng. In the taboo there stipulated with the following prohibits,'not to teach scheming, bellicose, alcohol-addictive, indecent people.' It features the following contents as acupoints pointing, ten-piece brocade, 18 steps of stances, 35 steps of hand training, opponent-responsive knack. SanFeng Primeval 13 Posture Tai Chi Chuan. It was introduced to public by great Kung Fu master Wan Lai Sheng when he was 80 years old. What do the 13 postures mean, people may ask. In fact, postures as shed, catch, shove, press, poke, swing, elbow and lean against shall well match the eight trigram of Qian, Kun, Zhen, Dui, Xuan, Kan, Gen, Li. Step forward, step backward, look leftside, look right side and hold onto center compose that well matching 5 elements. So, adding them together we can get the total number of 13. Based upon the 13 postures, Zhang San Feng develop it further and thus gave arised the San Feng 72 Posture Tai Chi Chuan. Wudang Taiyi Five Element Boxing Originally given the name of Wudang Taiyi Five Element Capture 23 Posture Form Set. It was until in 1980 when a Kung Fu demonstrator called Jin Da Tao showcased the arts that it became to be popular gredually. By Jin Da Tao's account, in 1929 he went ot Purple Heaven Palace and studied the art 7 months with then Taoist Priest Li He Lin. By Li He Lin's words, this form set was created by Zhan Shou Xing (1488 - 1504) in Ming Dynasty who incorporated breathing, DaoYin and boxing together based upon Tai Chi 13 Postures. This Kung Fu form set well accords to the five element theory, especially the generating and controling relationship. It focuses upon both the health preservation and boxing application together, pay attention upon the mind-will deployment rather than the force using. It can unconsciously melt the upcoming force and find the weakness point exposed in the process and take hold of the opponent in an hidden way. Stillness and motion are well weaven into together to form an integrity. Breathing and mind are combined together as like the flowing water and flying cloud, presenting intangible circumstance into which opponents can not peer into. The main feature are as follow: hand postures are soft and thread, the stump stance steady, two arms holding in a circle, foot stance in circular form, movements more like the snake walking through grass, all postures connected tight without apparent gap. Wudang Pure Yang Boxing It is heard the Lu Dong Bin, the famous immortal in Taoism, created this form set. It has been circulating continusly in secret in WuChang area, Hubei Peovince. In DaoGuang period of Qing Dynasty, Wudang taoist Wang Zi Dao studied with Long Xin priest and in 1928 Wang moved to WuChang area and taught this art to Liu Ding Guo who later practiced this art for more than 50 years and never exposed it the least to the outside. In 1972 he passed on this form set to Wang Zhao Hui. The mechanism of Pure Yang Boxing is based upon the He Drawing, Luo Writing, as they holds that left side revolution leading to birth of each other, right revolution leading to a restrain of each other. The main contents include the Belly Breathing GaoYin kung, Qi Deployment process, Purity Yang Preservation kung. Purity Yang Boxing is required to be learnt forst and Purity Yang Sword the next. Zhaobao Tai Chi Boxing Starting from Wen County, Henan province, Zhaobao Tai Chi Boxing began to circulate among common people. In the book Ancestral Source of Tai Chi Chuan published in 1939 towards such Tai Chi form there has the clear description as to the lineage, theory basis. In recent times, some descendants like Liu Hui Zi, Xie Jian Hai, Liu Rui one after another published articles claiming its Wudang Kung Fu similarity. The boxing progressing influence, fighting doctrines it holds onto features many similarity with Wudang Kung Fu. Also, they regarded Zhang San Feng as the common ancester. Zhaobao Tai Chi Boxing altogether boasts up to 75 postures, incorporating Push hand, free fighting and stances posing. Also, the 24 methods are well melted into the skills and upper level, middle level and low level each has 8 methods unified. It is the true Kung Fu form. Wudang Ba Gua Chang In Qing Dynasty Kung Fu master Dong Hai Chuan creadted the Ba Gua Chang. The beginning period when it circulated in Beijing, people called it turing-grinding-stone boxing. Later on it was fixed to be called as Ba Gua Chang and 64 postures were thus set up. Soul Captivation Boxing One Wudang Taoist called Shen Cheng Kuan learnt this art when he wandered to White Cloud Temple in Mt. Heng of Shanxxi Province. Later on it was passed on to Zhan Kai Wen, the No. 18 descendant of the lineage. Its practice doctrine holds that it features Yin and Yang, five element magicity, harvesting excellency of Tai Chi Xing Yi and Ba Gua. Taiyi Six Harmony Kung It was presented to public by Cheng Ding Yuan, who was the No. 22 descendant in the lineage. Six Harmony is the treasure among Wudang Tai Chi Chuan, belonging to motion Kung Fu and Daoyin category. It is devided into six pieces and the whole postures look smooth and slow and graceful. It intends to reach a harmony in harmony and emphasizes the stump stance, take the cat-like foot stance, incorporeating some elements from Shaolin school. Cyclone and Thunder Boxing Then aged 12, Wang Shu Zhang apprenticed to Zhao Chao Ran, a taoist wandered away from Wudang. Wang studied the art 12 years and learnt the steel head Kung, steel board Kung, Eargle Claw boxing and Cyclone and Thunder boxing. Taiyi Primevals Blending Ball This arts belong to Steel Pine Faction, Wudang Taiyi School. It was introduced by Liu Tie Cheng. There exists a professional book telling the details of this kinds of martial art. In fact, it compose of three parts, Taiyi Primevals Blending Ball is the first step, the other two is Eight Trigram Ball and Go-as-you-like Purple Gold Ball. Some people regard it as the most valuable treasure among Wudang Internal Kung Fu. Wudang Taiyi Heavenly Eagle This Kung Fu form is the small faction of Wudang Taiyi school. It is recorded to be handed down by a hermit living in Sun-facing cave in Southern part of Wudang mountain. It enjoyed more than 200 years of history. Taiyi Magic Sword Boxing It is heard to be created by Zhang Sanfeng. In 1988 Master Guang Heng jiu offered the arts to the public. It was originated from the book Wudang Anscestral Boxing written by Master Guang's anscetor. There are altogether 24 Chinese charactors in the recording. One character one set of Kung Fu form. Therefore, one character is used to train the external Kung Fu, internally it is used to train the magic sword - the fingers it mean. The adversary generally do not regard fingers as a sword and may omit its attack power. But when in the close-by fight it can play a decisive role. Wudang Alchemy Sword It is heard to be creadted by Zhang San Feng, who divided such fome set into three parts and the lowest serie was handed down to the taoist called Wild Crane. There is a poem describing the sword wielding status as "I practice sword and gradually get into the subtle stage, magic hand holding the magic sword, the flying birds are to be frightened into flee while no dust dare attach to the sword. In a flashing light by sword blade no people can be beheld." Wudang Eight Immortals Sword Also called Tong Bei Palm. Together with Tai Chi, Xing Yi, Be Gua to be called as Wudang Four Haomonization. Its theory is well based upon the doctrine holding that kidney works as the source of Qi circulation, connects the small water wheel and large water wheel, deploying Qi with mind-will, use Qi to deploy the body. Therefore, all flexibility of body movements is centered upon the golden mean doctrine, to capture, to point, all presenting the unfathomable inner meaning. The palm progression is well tightened and connected as a whole. The rhythm is clearly marked to show the force contained in it. Small Threading Hand Play-108 forms It is heard to be taught by Taoist priest Yunxiang, who happened to travel in Shandong Province and chanced to find satisfied disciple. Inherited the essentials of Wudang boxing, incorporate the skills of Capture and counter-capture, offense and defense, to form an continuous double-fighting form set, featuring counter-capture, nicety-capture, borrowing-momentum, issuing capture in the snare, offering solution in circle, etc.